UK Release Date - 17th February 1984. US Release Date - n/a. Producer - Robert John 'Mutt' Lange. Group Photography - Ross Halfin. Special Formats - Limited Edition (500 copies) 7 Inch Gatefold Wallet sleeve. The last UK single from 'Pyromania' was released in February 1984. 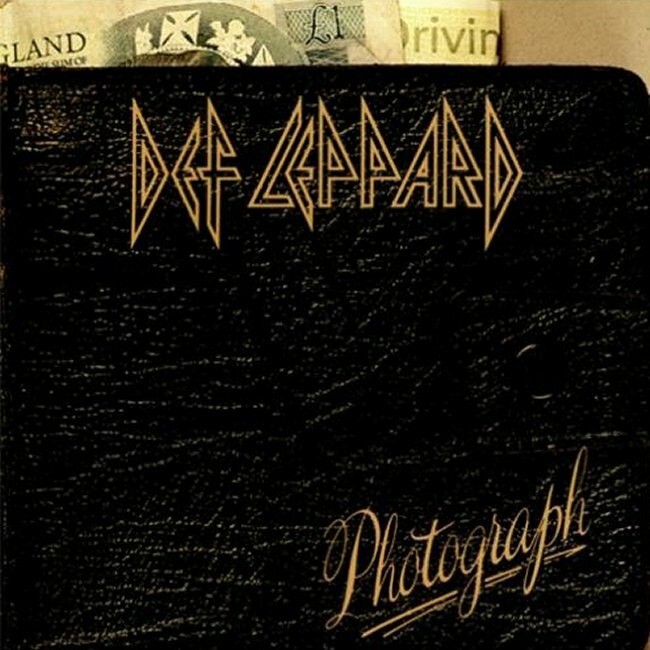 'Photograph' was the first single to be re-released in the UK having already been issued a year before. Despite increased interest in the band it failed to chart in the top 40. The three formats featured the same tracklisting but different catalogue numbers and artwork. Another Limited Edition 7" was issued. This time with an embossed gatefold wallet sleeve. It gave the appearance of a wallet with money inside when opened. On the inside left was a promo shot of Marilyn Monroe lying on grass. On the right a live pic of the band playing 'Switch 625' by Ross Halfin. Behind these at the top English pounds and an American Express card shown as if poking out of the top of the wallet. Like the 1983 Limited Edition 7" this one was also limited to just 500 copies. The back cover of the 7" featueed another Ross Halfin shot taken from the 'Foolin'' video shoot. Two versions were released of the 12", one with the same tracklist as 1983 and one with NO NO NO as the second B-Side. All on formats of this single 'Bringin' On The Heartbreak' is the 1981 original version.